The apparel and footwear market in the United Kingdom (UK) has been growing steadily over the last seven years, with 2018 expecting to set the market value at 60.7 billion euros. In addition to the market value, the annual expenditure on clothing, based on sales volume, has also seen a gradual increase, reaching 57.8 billion pounds in 2017. 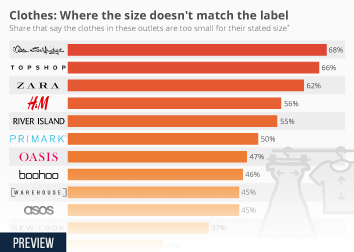 The majority of clothing purchases come from women in search of outwear garments, which account for nearly double that of men's outerwear purchasing. There are many leading brands which hold value in the UK market, including high street retailers, such as Primark, Next, New Look, and online shops, like ASOS. In recent years, growth in internet sales of clothing has been considerably high, with 56 percent of individuals purchasing clothing online in 2017. Despite this growing trend, many consumers still prefer to buy clothes in physical shops and offline purchases are predicted to remain responsible for around 71.2 percent of sales by 2020. The apparel manufacturing market is also holding steady in the UK, with the number of enterprises growing over the last five years. This increase in company numbers has been coupled with a rise in the value of clothing exports from the country, which were worth approximately six billion pounds in 2017. Growth in the apparel market has also been supported by the rise of niche markets, such as plus size clothing, which garnered 18.7 million pounds in 2016 alone.